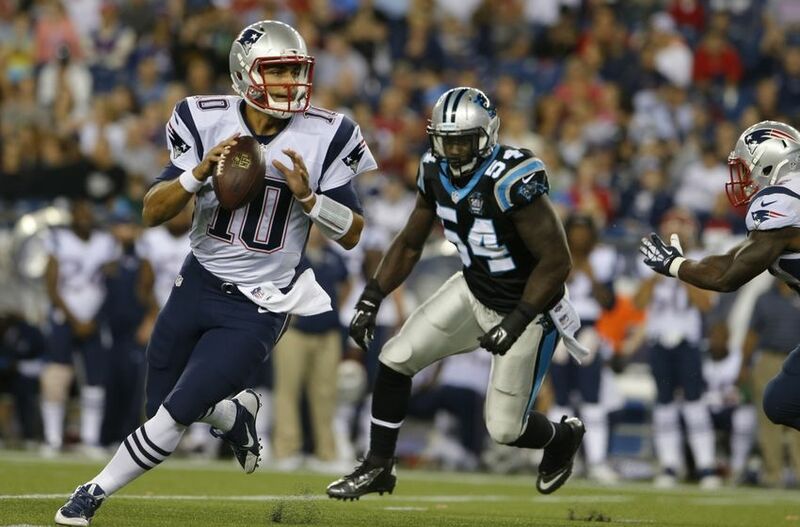 New England Patriots: Questions About Jimmy Garoppolo Will Be Answered Against Panthers | NFL News, as it happens, when it happens. Your one stop shop. The third preseason game for any National Football League team has annually been the, “dress rehearsal game.” It is the closest teams will get to a live action, regular season contest. The starters play throughout the first half and into the third quarter. In addition to the in-game level of play, the week lead up is very similar to a regular season game with strategy, film analysis, and most importantly who is going to start. What Patriots fans should expect to see on Friday night in Charlotte is for Tom Brady to be on the field to start the game with as many starters as possible, that are healthy. Rob Gronkowski has not played in a preseason match up since 2012, mostly due to health. Due to this year’s circumstances, there seems to be a better chance that Gronkowski will play in this upcoming game. More often than not in the third game of the preseason Tom Brady has played all through the first half. Bill Belichick in his press conference earlier this week finally hinted at, “Tom’s situation” being a factor in the game plan routine. Opening night is less than two weeks away and Bill Belichick still does not know who his starting quarterback will be. Belichick has to take precautionary measures and play both players equally with the starters. When Jimmy Garoppolo finally gets out on the field Friday night, we will get a look at what he looks like with the first team players against a legitimate pro level defense. With players such as Luke Kuechly, Star Loutulelei, Charles Johnson, and Thomas Davis coming at him Garoppolo will get a taste of what it is really like to be the starter. 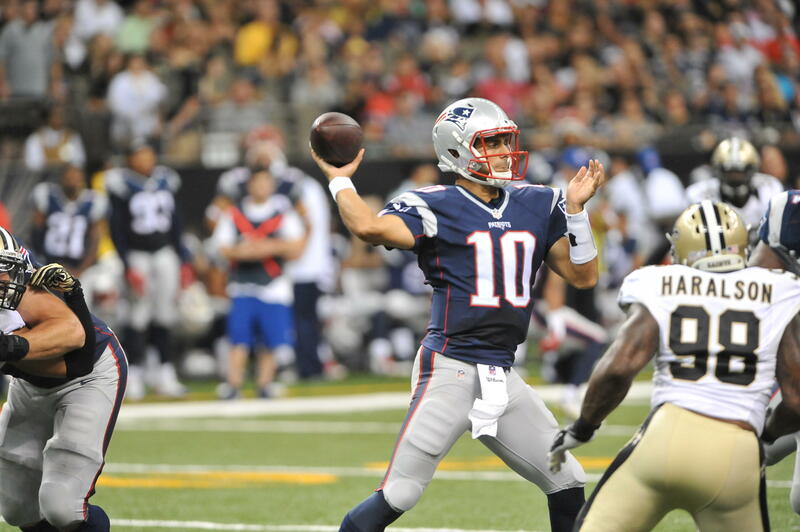 Since he was drafted in April of 2014, Patriots fans have been gushing over Garoppolo. He has not been criticized much by fans and some media members. It is almost as if he is being coddled because he, “shouldn’t be compared to Tom Brady.” Well that is too bad because thats who he is taking over for, and it comes with the territory. Last week he came into the game in the second quarter with all second-team players on the field. He had a very good game bringing the Patriots back from a 21-0 deficit, to win by a score of 26-24. He went 28 of 33 on the night throwing precise passes to Chris Harper and Jonathan Krause. Also, when his down field reads were gone he made the smart decision of dumping it off to James White and Dion Lewis. That was the first time I saw him really control the offense with the poise of a starter. However, the speed of the game in the second half of the second preseason game against back ups is much different than when you are going up against starters. Even the third game can’t even compare to regular season speed, but it will be the highest level we have seen Garoppolo play at. Throughout training camp, Garoppolo’s biggest issue was holding onto the football. He would sit back in the pocket and scan the field too long to the point were he would have to throw it away in a real game, or he would force it down field and get intercepted. On Friday night receivers are going to get jammed up at the line of scrimmage or they won’t be open down field as quickly as they should. This is when we will learn what Garoppolo is made of. What Garoppolo should do when everything collapses is use his biggest attribute, his legs. Use your instincts and run for the sideline, get some yards and get out of bounds. That is how he can make a name for himself because it is something that Tom Brady has never been able to do overly effectively. In the end, I believe that Jimmy Garoppolo will be slightly upsetting for Patriots fans on Friday night. He has just never truly taken snaps in a real full-go situation against big time players. In addition, there will be a patch work offensive line in front of him trying to block one of the league’s best defensive fronts. I think that the pressure will get to him and force him to make bad decisions. I hope I am wrong, but I have a feeling that after Friday night fans won’t feel as good about the situation with Tom Brady if he does have to serve some type of suspension.